firmed also the mental peace. tual wireless Access Point. Compatible with Wi-Fi Protected Setup (WPS), establish a WPA2 secure con- nection, more secure than WEP encryptions. PIR sensor generates +5v and -5v sine signal when any human or animal passes in front of the sensor or any movement is detected of human or animal in front of this. A breakout board is used to detect this signal and convert it into a longer digital signal. The output of PIR sensor can be adjusted. For max it can create an output signal for approximately 1.2 seconds . This is more than enough to detect the signal. has arrived But if only one interruption happens like human motion then it’s indicates that a thief or robber might have come. An individual interrupt of calling bell indicates pir sen- sor has gone out of order. When the system received both the interrupts raspberry pi take a snap shot of the person through wifi camera. Here the camera is connected with raspberry pi through wifi network. 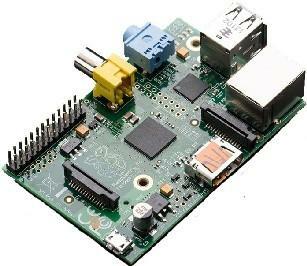 Raspberry pi transmits the snapshot through gmail. And also generates a tweet that someone has arrived. But if only PIR sensor generates the interrupt then it generates an instant alerm that might have someone is trying to have unauthorized access or break into the house. It takes several snapshots and generates several tweets to the user as alert. The 1.8’ TFT LCD is connected through serial peripheral interface and the magnetic lock is controlled by a GPIO. Here is the flow chart of the system. At first the system detects human and automatically raspberry pi take a snapshot which means the image acquisition part. After that image is attached and mailed to user that is the image processing, mail & tweet part. At last when user sends a re-tweet of door lock or open according to users command the magnetic lock gets open or close. Fswebcam is used to take the webcam snapshots by the Wi- Fi camera. Also this Wi-Fi camera is accessible from anywhere for a live view of the visitor. Here is the interrupt portion. If interrupt from PIR sensor happens then the cam is commanded to take snapshot. The system needs its own username and password so that it can access to the account and generate a mail automatically. The email address and password of the system is given bel- low. After connecting to the server the server needs the email address of the user. The users email address is given bellow. The image is attached as Visitor at your door.jpg and mailed to mdnasime@gmail.com. In order to tweet from Raspberry Pi to notify the user about the visitor Twython needs to be installed on the Raspberry Pi. It’s a a Python module for interfacing with Twitter. A OAuth access token is needed, this gives application to access the us- ers twitter account. By default, the app is set to read-only, so user won’t be able to publish tweets without changing that to Read and Write. Need to change from Settings tab and change the Application type. In addition the user can also have the picture of the visitor instantly on twitter. The following needs to be followed in order to tweet picture from raspberry pi to twitter account. Here pygame libraries are used to take picture from the cam- era. Here the figure of the implemented hardware is given. All the components and connected according to the main circuit diagram. When the PIR sensor is interrupted then the Wi-Fi camera takes a snapshot and E-mail that attachment to the respective E-mail account and generates a tweet in the twitter to notify the authorized person about the visitor with picture. The user can then see the visitor either from web from anywhere in the world by Wi-Fi camera. If the user wants to give a message to the visitor, user just tweets in the twitter and the visitor can see the message on the screen on the front face of the door or the user can send command via twitter to open the door. When the PIR sensor faces obsticles or detects human or the visitor rings the bell the camera takes a snapshot and send it via Email to the users account. The user can commad to raspberry to close the door.  Internet of households where we can attach other devices of house with internet.  Industrial automation and control through internet. The system can be used in several places like banks, hospitals, labs and other sophisticated automated systems, which dramatically reduce the hazard of unauthorized entry. Evidence can be given to the security department if any robbery issue occurs. But the system needs to be monitor always that the internet bills are paid in due time to keep connected with own home.